Luxury Lakefront Lodging In A Very Peaceful, Private And Scenic Setting! NEW LOOK FOR 2018! 2 level 3 bedroom, 3 full baths, bonus bunk room, 2 decks! We are so blessed to have the opportunity to offer our second vacation rental home on Lake Cortez. Pulling out all the stops our home has plenty of room to relax and lodge in luxury! Upper-level master bedroom, 2 lower level bedrooms all with full baths and lake views (see pics please). Eat-in kitchen, full laundry, all season room overlooking the lake. Upper and lower decks fully equipped with great seating. brand new bbq grill. Half of the lower deck is covered for unfavorable weather too! Lakefront has a covered dock with a great swimming and fishing area! 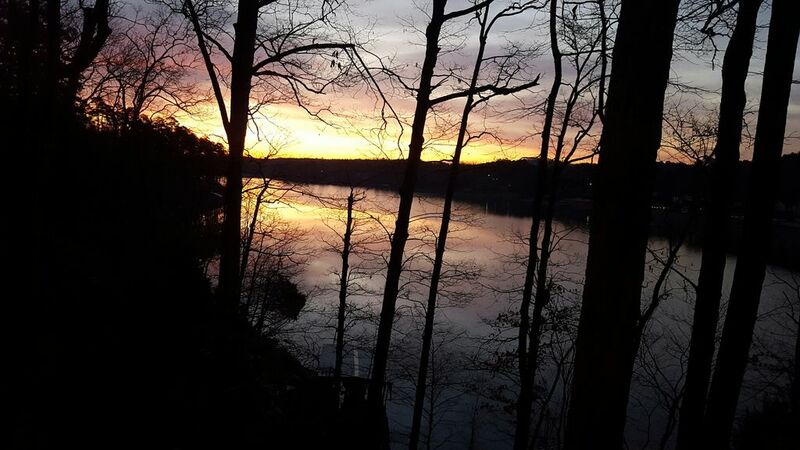 Wake up to an unforgettable sunrise overlooking the lake as each bedroom looks out to the lake! Updated pathway to the lake makes it way down to the lake. A new paddle boat and new paddle board for your enjoyment! We also have 2 brand new novice kayaks available ( a third kayak may be provided upon request! Bring your fishing poles as I know there is a very good chance you will be reeling one in. We may have a few fishing poles to use upon request! This home is a nature lover's paradise as we also have a great family of birds that visit our feeders daily as well! We are excited about the newly painted rooms...new wood in upper great room and dining room, new carpet in master bedroom, new floors on lower level as well! New pictures to come!! An easier way down to the lake will hopefully be finished by April 1st...or sooner! We are very excited for our 3rd rental season for the Nordy Nest...we are very confident our home will be at the top of the list for many. We are also looking at other fun services for our clients as well. Our calendar for the summer season will fill quickly so if the Nordy Nest is on your interested list...our recommendation is to book as soon as possible! We have already had quite a few bookings and many other inquiries....get your reservation in you will not be disappointed! Wishing all the best in 2018!! We are very proud and grateful to have the opportunity to offer our second vacation rental property in Hot Springs Village....The Nordy Nest on Lake Cortez. Our original vacation rental home The TeeHouse on Cortez Golf Course has had such wonderful and positive results we were in the right place and right time to purchase our dream "Lake Home"...and we are delighted to offer the Nordy Nest to vacationers before we retire (wishing this could be tomorrow!..Ha!) We live and work in North Little Rock, 55 miles west of Hot Springs Village. I (Derek Jon) am a USPTA certified tennis teaching pro and my lovely wife (Katie Mae) is a certified Surgical Technologist in general surgery with Baptist Health. We are very humble and caring and absolutely love to be great hosts! We love to travel, anything outdoors, I hunt and fish of course, and Katie loves to find great deals just about anywhere....Our recent trip to Paris was spectacular and Katie's pride and joy find is hanging above the formal dining table (a solid cast-iron formal light fixture which is well over 150 years old!) We love our 3 dogs dearly..Destiny (I rescued her), Gracey (our neurotic swimmer), and Addie (our rescue which we traveled to Mobile, Alabama to get!) We love the vacation rental business and are attentive property managers. We are very hands-on and are always looking for ways to improve and make our homes better and more enjoyable. We have no kids but have plenty of nephews and nieces and I am even a very proud grand uncle of 4 great kids! I (Derek Jon) am from the mid-western state of Wisconsin and Katie is from the boot hill of Missouri. We both cherish our mid-western values and hard work ethic! We met online...yes online!....and were best friends right from the start and were married on 9/10/11 and I absolutely love being married to my soulmate. Katie says that her grandmother "prayed" me up for her precious granddaughter! We are simple and humble and love to laugh! "Live, Love, Laugh"
Katie fell in love with this property the minute she stepped inside the door...so much...she made an offer on the home without even talking to her hubby first...ha! We still get this "I can't believe it" feeling every time we are there. This home is custom built with many high-end features. When our offer was finally accepted we then had to go through the ups and down of closing...thank God it all worked out. If you choose this property for your vacation stay you will know why we are so very pleased and grateful to own this home. The property is very private and sits up on a small bluff providing a great birds-eye view of Lake Cortez. Lake Cortez is quite clear and offers great fishing, boating, swimming and various water sports. I grew up on a lake in Wisconsin and everything about me loves "lakeside living"....especially with the feel of being in the woods as well! I am pretty sure this property touches every bit of Katie's heart and we are sure the Nordy Nest will do the same for you! We have had many "wows" during the personal tours we try and give when our guests arrive. The home is nestled in the woods...private....scenic...with the feel of all of nature's beauty. The use of 2 kayaks, paddle boat, raft, and a novice paddle board was a great hit last season as well! We fell in love with the location of the home first (only minutes from our other vacation rental property). We fell in love with the scenic view from the upper and lower decks of the home! Each bedroom has it's own full bath and view of the lake! The all-season room is a great eating, relaxing and visiting area! We love the large windows in the upper and lower great rooms bringing in plenty of natural light. The lower level has a wet bar area with a full size refrigerator. Great rooms are comfortably furnished and have 55" HD smart TV's! The home is very private and peaceful with a scenic walk to the lake. We have a large dock and great swimming area. Included in the rental is the use of 2 brand new Novice Kayaks, paddle boat and a paddleboard. For the nature lover this home and the property has it all! The home sits on the bluff side of Lake Cortez giving it a birds-eye view of the water. There is a downward path to the lake and dock...you will get your exercise on the way back up! The fishing is great right off the dock! The lake is very peaceful and the traffic on the lake is very minimal! toilet, shower, bathroom is connected to lower level bedroom with queen bed. Each bathroom is fully equipped and well stocked. The Nordy Nest is located in the gated community of Hot Springs Village. Very serene and private. The scenery is unforgettable and breathtaking. The Quachita Mountain region is very scenic! The view of Lake Cortez from the upper or lower deck is wonderful. Enjoy the serenity of a beautiful sunrise! The elevated view is perfect for great pictures or just relaxing. The Nordy Nest is on Lake Cortez. This is the 4th largest lake in the village. The lake is very clear and has a maximum depth of 50 feet. The fishing is fantastic and water sports are allowed. The Nordy Nest home sits up on a bluff with a wonderful birds-eye view of the lake. The home has a great sun room, upper and lower deck with part of the lower deck being covered. Every bedroom has a lakeview! Main level has a great room with big windows. Off the kitchen is an all season room! Big upper and lower decks with part of the lower deck being covered. The Nordy Nest home is elevated from the water. The walk down to the lake and covered dock is short with a moderate downhill grade. gas fireplace in downstairs great room that is available during the colder months! We have a new outdoor gas fire pit on the upper deck! Plenty of parking in driveway by garage or even above. Driveway is a bit steep but all cars can make the grade! Garage is not available for parking...unless absolutely needed. stove top is a electric ceramic top. Kitchen has a double oven....the upper oven can be used as a convention oven....works very well!! We have 3 different areas to enjoy your dining. Dine in kitchen ..seating in the all season room w/ great view..seating for 4-6 in upper great room w/view. Formal dining area as well....seats max 8. Televisions in upper great room, and lower great room....all TV"s are smart with High Definition. we have 2 kayaks and a peddle boat available to use...all guests are required to sign a waiver. Also available is a novice paddleboard! Beginner board. our dock is available for you to put your boat in and park...In the near future we will have a boat available to rent! We provide 4 life vest...water rafts...plenty of towels. A novice paddleboard is provided for use as well! This is great fun for adults and kids ages 8 and above! Hot Springs Village offers 9 different golf courses managed by Troon Golf! The master bedroom has a large jetted jacuzzi hot tub and the Coronada Center has a jacuzzi style hot tub. This is home is very secluded and private with many great picture opportunities on our property. Our landscaping is very natural and gives the rustic feel of being in the woods. The path to the lake is navigable but is switchbacked down to our dock. We are avid bird watchers and have great visitors to our feeders off the upper deck...great photo opportunites...if you are really lucky a bald eagle may land in one of our trees!....or you may see one of the unique red-headed woodpeckers that come for a bite early in the a.m. We also encourage our guests to feed the fish...food will be provided down on the dock....bring your fishing poles if you want a chance to catch one as well!! Had a very pleasant stay here. Owner is very responsive. Lake is quiet. Easy access to Hot Springs Nat'l Park and Lake Ouachita. Great hiking. This property is in an amazing location. The lake is literally right out the back. There are all sorts of water crafts available for guests’ use. Our family used the paddle boat to give the kids the thrill of some lake activity. It was too cold for any other of the water toys. The guys fished some, and actually caught a nice bass. Everything you need is here for an enjoyable family outing. The house is well equipped and location is amazing. Windows provide Great Lake views from every room in the back of the house! The decks are great for grilling and enjoying view of lake. The fire pit was great for making s’mores. The house is somewhat dated, but continually be maintained and updated. The price makes up for the bit of things that still need working on. Some fun things we did: Garvan Gardens, Ron Coleman Mine, Hot Springs bath houses, go-cart and arcade nearby and some shopping in downtown Hot Springs. Great location for doing all these activities. Beautiful views, comfortable home! Easy access to the owner and very friendly! Just a wonderful experience, the sunrise is breathtaking! We loved the view and spacious living room areas in this comfortable home on Lake Cortez. Derek was so nice and always there to make our stay feel more like home. Very nice home and great location! Our group of eight golfers thoroughly enjoyed our trip and stay at the Nest. Plenty of room to spread out, nice views, excellent kitchen equipment and cooking gear. We BBQ'd steaks one night and had a terrific dinner. Extra fridge in the basement came in handy. Sleeping arrangements were a little tight with 8 guys but we made it work and it made our cost per person unbelievably reasonable! Our home is only 30 minutes from "Spa City"... Hot Springs. Historically known for the healing powers of the earth's hot water used in the bath houses. A few of them have been remodeled and functional. Magic Springs amusement/water park is only 25 minutes away just on the outskirts of Hot Springs. Oaklawn Horse Track and Casino is in Hot Springs with live horse racing from mid January to the end of April. Try your luck digging for Arkansas's most popular and beautiful rock, the crystal quartz, at the Coleman Mine located only 15 minutes from the west gate. This is a very popular attraction for every age! Please ask for more details. Lake Quachita and Lake Hamilton are within 30 minutes. Lake Quachita is one of the largest and deepest reservoir lakes in the country and known for some of the best sports fishing in the area...especially if you are looking to land a lunker striper bass! A few miles outside Hot Springs near Lake Catherine is Marvin Garvin Gardens..a botanical adventure for all ages! The capital, Little Rock, is only 60 minutes away where you will find the Clinton Library, great shopping and tasteful restaurants. Just before Little Rock is a Bass Pro Shop and newly built outdoor outlet mall! Hot Springs is home to wonderful spas, unique artists and art studios, waterfront restaurants, and let's not forget the live Oaklawn Horse Racing (seasonal) and Casino (open all year)! Within Hot Springs village you will find a variety of hiking trails, the Coronado Tennis and Fitness Center, and the Desoto Recreational Park. Make sure you ask the owner in your inquiry on how to find out more information on the best kept secret in the nation...Hot Springs Village..."An unforgettable Vacation Destination!" We are excited to announce quite a few changes to the Nordy Nest for 2018! The upper great room/family room will have new flooring and paint. The master bedroom will have new carpeting and painted. The kitchen has a brand new high-end refrigerator, dishwasher and fresh paint. The lower great room/living room will have new flooring and new paint. The downstairs bedrooms have new queen mattresses and new paint as well! The back bunk room has a new queen bed and the 2 twin beds...new pics will be coming soon! The addition of a gas fire pit on the upper deck makes for a fun gathering on the upper deck. We are hoping the new stairway down to the lake to be completed by mid-March (this is quite a project but will really make it so much easier getting down to the dock so you all can enjoy the lake. We have a new peddle boat, 2 new kayaks and a new paddleboard which are all included in the rental price. We also provide many flotation devices and have life vests as well. The Nordy Nest calendar is already beginning to fill up so get your reservations in! We are consistently updating our home to make sure we can provide our guests with a 5 star quality vacation rental experience. We are so very thankful for all of our return guests for 2018 and hope that we see more of our guests from 2017 return for another memorable experience! We look forward to having the opportunity to be your HomeAway from home vacation rental host and hostess!